A woman in China accidentally swallowed a metal spoon while trying to remove a fish bone stuck in her throat. The spoon remained in her body for four days as she neither experience any pain nor bothered to visit a doctor. She swallowed the spoon before Qingming Festival on April 5 and as it was a public holiday, she did not want to take the trouble of going to a hospital. She then decided to wait for some days as she did not feel any pain in the stomach. 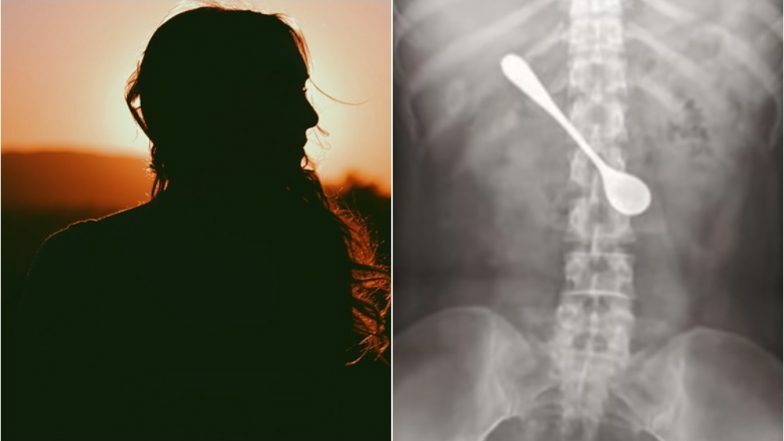 An X-ray image showed the shadow of the metal spoon in the woman's duodenum following which doctors decided to conduct endoscopy. Dr Sun Tingji at the hospital's endoscopy department was quoted as saying, "As the spoon was in a somewhat horizontal position, we carefully adjusted it before pulling it out vertically." The procedure lasted for only 10 minutes. Dr Cheng Chunsheng was quoted as saying, "The woman was trying to retrieve a fish bone stuck in her throat when she accidentally lost her grip and swallowed the spoon." Nashik Boy Accidentally Swallows a Rs 2 Coin, Doctors Successfully Remove it. Dr Cheng said that the metal object that caused swelling and erosion in the woman's duodenum. She was discharged from the hospital following surgery. This is not the first time, something so bizarre happened. Last year, doctors in Urumqi in Xinjiang removed an eight-inch spoon from a 26-year-old patient's body. In September 2015, doctors had removed a six-inch metal spoon from a woman who swallowed it while eating noodles. Similarly, a student had an icecream spoon when someone knocked her which was later successfully removed.